The Harbor Maintenance Tax is a fee collected from users of the maritime transportation system in order to fund the Army Corps of Engineers’ operation and maintenance activities. In the Great Lakes, these activities include regular dredging of harbors, maintenance of breakwaters, and operation of the Soo Locks. Despite the fact that adequate revenue is being collected (approximately $1.7 billion annually), Congress has restricted spending on harbor maintenance due to budgetary constraints. The result is crumbling infrastructure and harbors choked with sand and silt. In the Great Lakes region there is a $160 million dredging backlog. Breakwaters and other navigation structures need $320 million in repairs, and the Soo Locks require $75 million in upgrades. The Water Resources Reform and Development Act (WRRDA) called for full use of harbor maintenance tax revenue and laid out incrementally larger spending targets between FY2015-25. Congress should hit the target established in Section 2101 of WRRDA and provide at least $1.59 billion in the FY2020 Energy and Water Development Appropriations Bill to fund the Corps of Engineers’ operation and maintenance activities. AGLPA supports enactment of legislation to provide a long-term funding solution for harbor maintenance. In 2018 the U.S. port industry agreed to a proposal that includes the following elements: 1) mandatory spending of Harbor Maintenance Tax revenue; 2) a funding distribution plan that directs 10% of maintenance funds to the Great Lakes region and an equal percentage to five other U.S. port regions; 3) directs 10% of maintenance funds to emerging harbors (those that handle less than 1 million tons of cargo annually); and 4) directs between 10% – 20% of funds to donor and energy transfer ports. Owned and operated by the Army Corps of Engineers, the lock complex at Sault Ste Marie, Michigan (“Soo Locks”) enables ships to navigate the St. Marys River, which connects Lake Superior and Lake Huron. Through this critical infrastructure, Great Lakes commercial vessels carry iron ore and other raw materials that feed the nation’s steel industry, agricultural products destined for export markets, and low sulfur coal fueling the region’s electric utilities. Unfortunately, the lock infrastructure is old and in need of repair and replacement. Congress originally authorized construction of a new large lock at Sault Ste Marie in the Water Resources Development Act of 1986. The project was reauthorized in 2007 and again in 2018 at a total cost of $922 million. The project is currently under construction with first-year funds provided in FY2019. The Corps’ FY2020 budget includes $75.33 million for the new lock. While this is welcome and important support, the agency estimates that it could deploy up to $89.2 million in construction funds during FY2020. Congress should keep the project moving forward and provide second-year funding of $89.2 million in the FY2020 Energy and Water Development Appropriations Bill. The two operating locks at Sault Ste Marie were constructed in 1948 and 1968. In 2007, the Corps of Engineers began a multi-year Asset Renewal Program to rehabilitate and modernize the Soo Locks’ infrastructure. The goal of this program is to improve the efficiency of lock operations and reduce the risk of lock failure and possible vessel delays. The FY2020 budget provides $2.6 million to rehabilitate Soo Lock infrastructure – a shortfall of $2.4 million compared to the amount needed in FY2020. Congress should provide $5 million in the Fiscal Year 2020 Energy and Water Development Appropriations Bill to ensure continuation of the Soo Lock Asset Renewal Program. The Water Resources Development Act of 2007 authorized the Secretary of Transportation to initiate a program to repair and rehabilitate the Eisenhower and Snell Locks on the St. Lawrence River in upstate New York. In response, the Saint Lawrence Seaway Development Corporation (SLSDC) initiated a asset renewal program to rehabilitate the Seaway’s lock infrastructure and other capital assets. Originally constructed in 1959, the Seaway connects the Great Lakes to the Atlantic Ocean and provides Great Lakes states with access to world trade. The Administration’s FY2020 budget proposes $28 million for the SLSDC, with $8 million of the total earmarked specifically for asset renewal projects. This is $8 million less than the $36 million appropriated by Congress for the agency in FY19. Congress should maintain level funding for the Seaway and appropriate $36 million in FY2020 Transportation Appropriations Bill. Constructed between 1887-1922, the Chicago Area Waterway System (CAWS) provides a connection between the inland river navigation system and the Great Lakes, facilitating the movement of commercial maritime commerce and recreational boating. The waterway also serves an important role in the sanitation and flood control system serving Chicago and Northwest Indiana. Inland river barge transportation through the CAWS serves the Port of Milwaukee, Port of Burns Harbor, Port of Indiana Harbor, and Port of Chicago. In an effort to control the migration of non-native Asian Carp and other aquatic nuisance species, some have proposed physical separation and/or modification of the waterway. AGLPA opposes closure or extended disruption of navigable waterways in the Great Lakes region. AGLPA supports efforts to prevent migration of non-native Asian Carp and other aquatic nuisance species between the Great Lakes and Mississippi River basins, while at the same time protecting the vital role of maritime commerce. AGLPA urges the federal government to continue to pursue a comprehensive approach to this problem, including: operation and maintenance of electronic barriers in the canal near Lockport, Illinois; monitoring and sampling of fish populations; studying chemical and biological controls; expanding contract fishing, developing commercial markets for Asian Carp, and coordination with the Government of Canada to police illegal transport of Asian Carp in the aquaculture industry. AGLPA also supports continued development of a plan by the Corps of Engineers to modify the Brandon Road Lock in Joliet, Illinois, to include certain physical deterrents. AGLPA opposes any plan elements that threaten the health and safety of mariners. Similarly, the plan should not create impediments to the efficient movement of commerce. The opening and closing dates of the St. Lawrence Seaway vary from year to year due to weather conditions and the demands of commerce. The system’s locks have opened as early as March 20 and as late as March 31. The closing date has ranged from December 24 to December 31. In an effort to enhance the reliability of the shipping system, attract new cargoes and foster employment in the maritime sector, the United States and Canada should harmonize the Seaway’s opening and closing dates with those of the Soo Locks in northern Michigan. Doing so would establish a fixed navigation season for the entire Great Lakes navigation system from March 25th – January 15th. The Great Lakes include 20 percent of the world’s surface freshwater and host a diverse ecosystem of aquatic and terrestrial life. Launched in 2010, the Great Lakes Restoration Initiative (GLRI) was created to restore and maintain the chemical, physical and biological integrity of the Great Lakes Basin ecosystem. The GLRI seeks to replace earlier piecemeal approaches to ecosystem restoration with a single comprehensive program. The Environmental Protection Agency (EPA) leads and administers the restoration initiative and partners with multiple federal agencies to carry out restoration projects. Since 2010, Congress has appropriated $2.8 billion to support the program’s initiatives throughout the Great Lakes region. Unfortunately, the FY2020 budget request proposes to shrink the program to a mere $30 million. As stakeholders in a healthy, productive ecosystem, Great Lakes ports support the GLRI program and urge Congress to reject the Administration’s proposal and include $300 million in the EPA’s FY2020 budget. 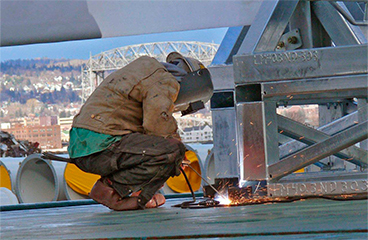 Great Lakes Seaway shipping supports 147,000 jobs in the eight Great Lakes states. This fact demonstrates that ports are important economic drivers. While our states invest heavily in highways, rail, airports and other transportation infrastructure, they largely ignore their ports. Of the eight Great Lakes states, only two (Minnesota & Wisconsin) have a state port assistance program. As a contrast, the State of Florida is investing heavily in ports as an economic development strategy. Between 2011-2017, Florida invested $1.2 billion in port infrastructure. Illinois ports handle more cargo tonnage than Florida ports, yet the state has no focus on ports. With more than 20 federally authorized commercial harbors, and twice the shoreline of Florida, the State of Michigan largely ignores its ports and has failed to strategically leverage these assets to grow its economy. The same can be said for Ohio. In late 2015, a regional maritime strategy released by the Conference of Great Lakes Governors and Premiers called for port investment by states. Great Lakes states should follow-up on that recommendation and enact harbor assistance programs similar to those in Wisconsin and Minnesota. All ocean-going ships operating on the Great Lakes and St. Lawrence Seaway are required by law to hire a U.S. or Canadian marine pilot to assist with navigation. The Great Lakes Pilotage Act of 1960, and its associated regulations, give form and structure to the pilotage regime in the sections of the Great Lakes under U.S. jurisdiction. In its current state the system is a regulated monopoly. Ship owners (the consumer) are required by federal law to employ pilots. Since there is only one pilotage service provider authorized in each geographic area, an effective monopoly exists. The Coast Guard exercises broad regulatory oversight over all aspects of Great Lakes pilotage, including the setting of fees. Under Coast Guard management, Great Lakes pilotage has become a runaway cost for international trade on the Great Lakes-St. Lawrence Seaway navigation system. In the last five years (2012-17), U.S. pilotage costs on the Great Lakes have increased 250 percent. Runaway costs threaten the competitiveness of international commerce on the Seaway system. Congress should review the Great Lakes pilotage program and the Coast Guard’s oversight of that program with the goal of improving safety, improving efficiency, reducing costs and improving the competitive position of the navigation system. Heavy ice threatens the reliability of Great Lakes-Seaway transportation early and late in the navigation season. The U.S. Coast Guard is responsible for breaking ice to ensure navigation and enhance safety. The agency’s Great Lakes icebreaking fleet consists of nine vessels: six 140-foot icebreaking tugs, two buoy tenders, and the heavy icebreaking cutter Mackinaw. Severe winter weather is placing a stress on these assets and in 2015 Congress authorized the construction of a new heavy icebreaking cutter, of similar capability as the Mackinaw. The project’s estimated cost is $240 million. Congress should include funds in the FY2020 Homeland Security Appropriations Bill to continue design work on the vessel. In 2010, Congress authorized a Port Infrastructure Development Program to be administered by the U.S. Maritime Administration. While the program remained unfunded for many years, Congress provided first-year funds in the FY2019 Consolidated Appropriations Act. Specifically, the legislation provides a total of $292.7 million and stipulates that grant funds are to be issued to public agencies and used for a variety of port improvements, including intermodal infrastructure, terminal equipment, wharf construction, cargo handling technology, etc. Unfortunately, $92.7 million of the funds made available in FY2019 are reserved for the 15 largest U.S. container ports (by volume). None of these ports are in the Great Lakes region and thus, almost 1/3 of the grant funds are off-limits to Great Lakes ports. AGLPA strongly supports continued funding for the Port Infrastructure Development Grant Program and urges Congress to include $293 million in the FY2020 Transportation Appropriations Bill. We urge Congress to eliminate any restrictions that hinders Great Lakes ports from fairly competing for scarce dollars. If not, then we urge that 15% of port infrastructure development grant funds be earmarked to the Great Lakes region.